Your donation will help provide permanent supportive housing for Idaho veterans in need of support to overcome homelessness. Too often many of our nation’s veterans are returning home from serving their country to find a lack of resources to help them get back on their feet. Please join us to help provide housing for local veterans experiencing homelessness. Of the 833 persons experiencing homelessness in Ada County in 2017, 124 were veterans, indicating that Ada County exceeds the nation average with 14% of our homeless population being made up of veterans. Ada County currently administers 187 Housing and Urban Development (HUD) Veterans Administration Supportive Housing (VASH) vouchers for rental assistance for homeless veterans. Locally, it is taking an average of 4-6 months for veterans to secure rental housing given the tight and competitive housing market. Our community has an opportunity to take an active role in helping house those that have bravely served this country. 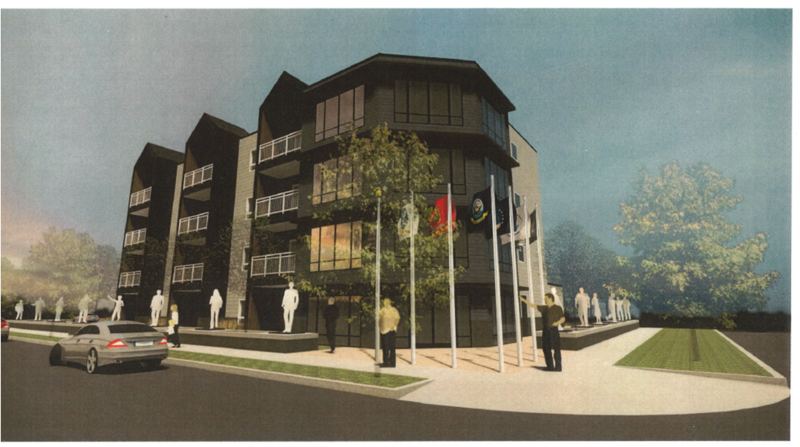 The proposed permanent supportive housing project will provide a lower-barrier or "housing first" model alternative for our veterans in need of services and support to overcome the issues that may have led to their homelessness. To make a project like this work, we must weave together resources to ensure the development is viable. While the location is yet to be determined, the development will require approximately an acre of land near the V.A. Medical Center in Boise and/or on a bus line. The new facility is proposed to have 27 units that will be fully furnished, each with a kitchenette and full bathroom. The site will include amenities such as laundry facilities, shared community meeting space with a full kitchen, private meeting spaces for service providers to meet with tenants, recreational space to promote active/healthy living, computer lab, external courtyard, a live-in manager, and a 24-hour surveillance system with controlled entry. Donations will be matched dollar for dollar until the $50,000 match provided by Together Treasure Valley is fully allocated. Together Treasure Valley is an initiative to make a lasting, meaningful impression on our community with member companies brought together by the Idaho Statesman including Albertsons Companies, Boise Airport, Boise Cascade, CBH Homes, Colliers International, Delta Dental of Idaho, Engineered Structures, Inc. (ESI), Idaho Central Credit Union, Idaho Power Company / IDACORP, Inc., Idaho Statesman, Intermountain Gas Company, Jacksons Food Stores, Mountain West Bank, Oppenheimer Development Corporation, Regence BlueShield of Idaho, St. Luke's Health System, and University of Idaho Boise. Additional details about who this project will serve is available via the U.S. Department of Veterans Affairs. Generous support has also been received from The Laura Moore Cunningham Foundation, Micron Foundation, Julius C. Jeker Foundation, JPMorgan Chase & Co., Wells Fargo, and Magellan Health. The Home Partnership Foundation is a 501(c)(3) organization created by Idaho Housing and Finance Association in 2005 to help people build a strong foundation for their lives through stable, safe, and affordable housing. We strengthen communities across Idaho by supporting shelters and re-housing the homeless; preventing homelessness by stabilizing households experiencing temporary economic, employment, or health crisis; encouraging asset-building to move clients from rental assistance into home ownership; and strengthening nonprofits focusing on housing services through the annual Avenues for Hope Housing Challenge campaign every December.